Repair corrupted .OLM files & Transfer Emails, Contacts, Calendars, Notes etc. to EML Format. Move bulk Outlook 2011 files of any size without facing any troubles. Save OLM converted email items from a GUID number of emails. Extract damaged OLM files and read recovered Outlook files into EML format. Preserve entire folder hierarchy of OLM emails in EML file extension as it is. Shows short summary as "Export Status" of restored OLM mailbox in EML format. Alternate to save & open Mac Outlook emails in EML via the subject of its emails in a system. Create separate EML file for each OLM email without hampering data integrity. Import and access OLM converted EML files on multiple supported email platforms. Retrieval of deleted email items from the Mac mailbox before OLM to EML conversion. 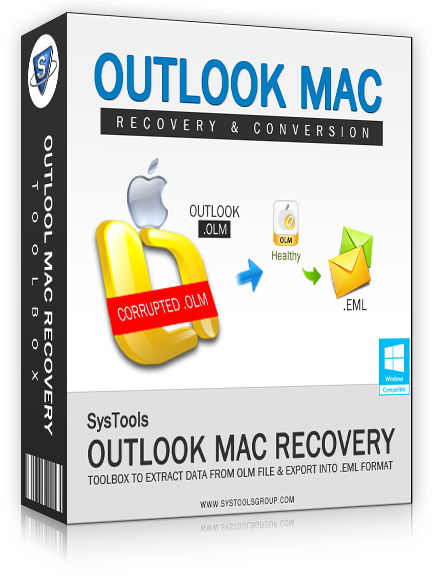 This software provides a platform for recovery of deleted Mac Outlook 2011 files and converts these recovered selected or bulk .olm files in EML format as one file can be added at a time. This tool open OLM file of any size for recovery and conversion to EML format. Size of OLM file and the number of emails in it does not have an effect on the quality of repair OLM files. The software always ensures that OLM mails are received in an organized manner once repaired. The parent & child folders will remain saved in the same form as it was in the OLM file before conversion. Software allows recovering only single OLM files, but multiple emails can be restore to EML file. Complete email recovery is assured with the tool in less time by processing large sized OLM files. It preserves all properties of the email with attachments. The metadata content like sender, receiver, date, etc. will remain intact while the mail is restored & move Outlook files into EML. Offers alternate for browsing the location to save the resulting files at desiring location on your local machine. It has the flexibility to choose on the storage location for saving the output files. To make the output manageable, Outlook Mac Recovery offers you two different naming conventions for saving the EML file with the "Subject" of the mail or with the "GUI" as per the user's need. This tool shows "Export Status" on the current screen. The number of emails exported, current folder path, subject of the mail being transferred etc. will be the part of the status report. Why Outlook Mac Recovery Software? "Outlook Mac Recovery Tool was recently awarded by Tucows on the basis of users Monthly Rating for the Month of November 2014." Full Edition Starting with $149 Price Onwards! "I created a manual archive of my Mac Outlook 2011 database & wanted to import the emails into EML files. Thanks to Outlook Mac Recovery, that offered a way to access OLM files into EML format"